Introduction-Keylogger Software is easy to use utility used to record every keystroke entries made from your computer keyboard. Specifically designed tool efficiently monitors the entire keyboard working and records every single key pressed by any user from keyboard that includes characters, symbols, digits and similar keyboard typing activities performed on your computer system. Keystroke logger tracks all typed keystrokes that includes username, passwords, send emails, online chat conversations, text files and similar typing activities. Software automatically prepares log report of entire keystroke operations with option to mail log details at specified email account. Utility displays professional, easily understandable log report and administrator even save log details at defined computer location. Invisible keystroke recorder is a advanced application used for recording online/offline PC activities and constantly monitors all accessed applications, from your computer system. Read only key logger software helps parents to keep a close watch over the internet activities of their children. Similarly, assists Company managers to control the non-productive PC usage by employees during office timing. Stealth keyboard monitoring software helps in catching cheating spouses, safeguards your kids and improves employee’s efficiency. Undetectable tool is used to track keystroke activities on PC and offer total control over computer activities. What can Keylogger do for you? • Records typed keyboard keys and user performed actions on the computer system. • Secretly tracks typed e-mails, passwords, chat messenger, documents and other typed data. • Records all online chat sessions and website URLs. • Automatically prepares encrypted log report of entire keystroke activities. 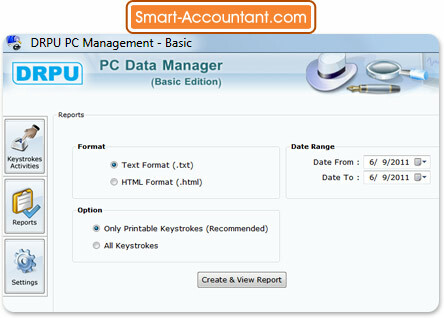 • Generate report of recorded data in Text or Html file format for further use. • Facilitates to mail log details at specified email ID. Capable to work in hidden mode and remains invisible from Add/Remove list, Start menu, Program folders and no shortcut icons on Desktop. Password protected feature prevents unauthorized users to change software settings. Hot keys and Run command settings helps to access software running in hidden mode. No technical expertise is needed to operate the software. Simple installation procedure, cost-effective and easily affordable.